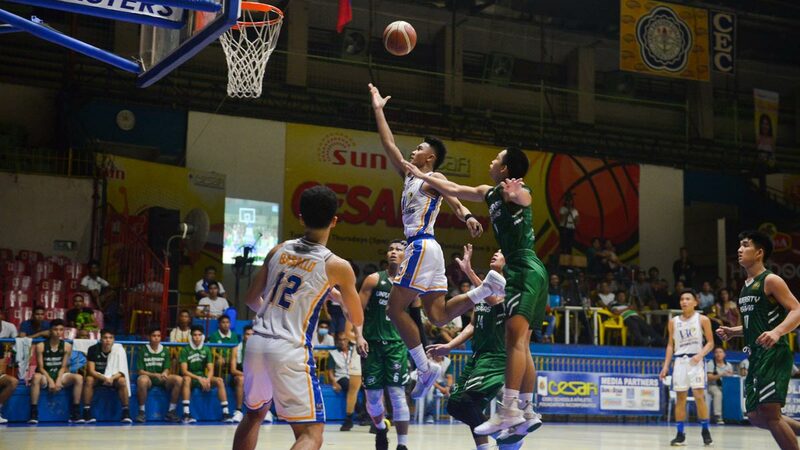 CEBU CITY— University of Cebu fought back from a six-point deficit with a minute left to trip defending champion University of the Visayas, 88-84, in Game One of the best-of-three finals in the 2018 Cesafi high school basketball tournament on Wednesday night at the Cebu Coliseum. UC moved closer to ending a decade-long title drought, with Game Two set on Friday. The last time UC won the high school title was in 2008 when Roger Ray Pogoy, now with the Talk N Text KaTropa in the PBA, led the team. The Junior Webmasters rallied to within two, 82-84, after layups by Jerick Ranido and James Basallo. The Baby Lancers sued for time and tried to inbound the ball from the sideline with 42.7 ticks remaining. However, Samuel Melicor’s bounce pass to teammate Franzel Basalo was tipped by UC forward Marc Delgado, who dove on the floor to recover the loose ball and passed it to a wide-open Jasper Pacana, who hit a triple from the top of the arc to shove the Junior Webmasters ahead, 85-84, with 35.7 seconds left. UC then held their ground on UV’s next offensive, denying Baby Lancer star Joshua Yerro with Delgado once again tracking down the loose ball and finding a streaking Basallo for a fastbreak layup to give UC an 87-84 lead with 5.8 remaining. The Baby Lancers had one last shot and got the ball to point guard Gabriel Cometa who shot an airball on his three-point attempt. UC forward Isaiah Blanco then put the series-opening win in the bag with a free-throw. “My players may be small but they are all hungry to win. I had faith in Pacana, I had faith in Delgado and they delivered when it mattered the most,” said UC coach Joever Samonte. Pacana finished with 17 points and three rebounds while Jerick Ranido added 13. Blanco, son of Cebuano basketball star Dondon Hontiveros, finished with 11 points and seven boards. The loss spoiled the triple-double efforts of Yerro who scored 15 points, hauled down 30 rebounds and handed off 10 assists. Cometa added 22 points for a UV squad that sorely missed the services of reigning MVP Beirn Laurente, out the title series because of chicken pox.